If you like having sliced meats, cheeses and vegetables at your fingertips, going to the deli frequently for the two former items or doing the veggies manually yourself is probably quite a chore. You can save a lot of time and effort if you get the best home electric food slicer that you can afford to do all these things in a short amount of time and with the least amount of effort. Sure, you could get separate a electric bread slicer or vegetable cutter for home use, as they can each be quite cheap, but by getting a single machine that does both as well as slice raw and cooked meat, you’ll actually save money in the long term. It also goes without saying that making your own luncheon meat or sausages at home and slicing it up for your family’s sandwiches eliminates all the artificial ingredients added to store bought processed meat. Game hunters will also find a slicer handy. We have selected five of the best electric food slicers on the market below, but if you’d like a wider range, Amazon is the best place to look. Now, keep in mind that this kind of slicer is usually big and meant to be kept on your counter or will at least need a good amount of storage space. However, it can slice whole loaves of bread or whole hams and roasts. If you’re more after a slicer that is really for smaller foods, like vegetables for salads, or cut up pieces of cheese, etc., take a look at the Presto Professional SaladShooter Slicer and Shredder. If you need to carve cooked meats and slice bread often but soft veggies and deli meats infrequently, get an electric carving knife instead. Razor thin slices are just as easy to get as are nearly 1-inch thick slices, and that’s what the Chef’s Choice 615 Premium Electric Food Slicer will give you. This all metal food slicer, except for the slider mechanism which moves smoothly, comes with a 7 inch blade, a 120 watt motor, and a hand guard that is also made of metal. For best results, you’ll have to chill the meat before slicing it up, but you’ll be able to slice off usable slices to nearly the end of the piece. Its carriage can work with large pieces of meat, like roasts and hams and it can slice directly onto a large food tray or you can use the tray that comes with it. This slicer’s included blade is serrated, which is what makes it great for cooked meat, bread, etc. If you’re not happy with its performance on medium soft cheese or salami, you could consider also buying the smooth blade. At 15 inches long and both 11 inches wide and high, it will fit on virtually any counter top. It is easy to clean, the carriage and hand guard comes apart so you can wash it in the sink, and once assembled back into place it all locks down to cover the blade. That’s a nice safety feature. If you want a decent food slicer at a price that won’t break the bank, check out the Continental Professional Series Deli Slicer. The 7.5 inch blade is a bit larger than most for some size versatility, and the machine body is all cast iron, except for the plastic hand guard. Don’t expect razor thin deli slices with this machine, but for virtually any other type of thin slicing, you’ll be good to go with the 150 watt motor. It won’t slice through hard and frozen food or sticky cheese but good and chilled nearly frozen meats and firm cheeses will be okay. In fact, we will call it one of the best electric meat slicers for home use. This is a big machine at nearly 17 inches long, so you’ll need some decent counter space to use it on. It is also one of the least expensive slicers on this list, so that should not be a reason to not buy it. Truly, if there was a best bang for the buck machine on this list, the Continental PS77711 would take the cake. If you want to get into a more commercial slicer for your home, but one that is still in the range of a home budget, the Chef’s Choice International Gourmet VariTilt Food Slicer is a “must buy.” This machine features a 7 inch cutting blade, so you can slice many sized roasts and bricks of cheese up to 9 inches in width, without a problem. Plus, the 100 watt motor is up to the task for most cutting jobs, and you’ll be able to cut razor thin deli style slices, just remember to go slow so you don’t overtax it. The VariTilt function allows you to gravity feed lighter foodstuffs at 30 degrees, like loaves of bread or veggies, and operates vertically for meats. About the worst thing you can say about this machine is that it comes with a plastic hand guard. This unit only cuts slices up to about 1/2 thick, but for most people, that should be more than adequate. It’s large at about 14 inches long but lightweight, it breaks down for easy cleaning and both the hand guard and carriage are dishwasher safe. The Best Choice Products Commercial Deli Meat and Cheese Food Slicer may be one of the most expensive units here, but for absolute deli quality, nothing else comes close. It is a semi-automatic, belt drive machine. 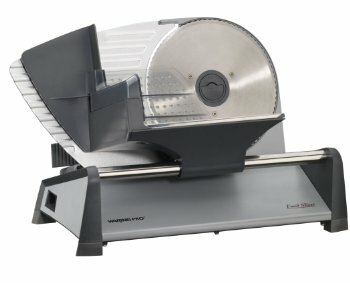 The 10 inch blade lets you slices large roasts and rounds of cheese, and the 240 watt motor is the largest and most effective motor here. This all metal slicer, and even the hand guard and carriage are metal, is heavy duty from top to bottom. It’s heavy in weight too, weighing in at nearly 50 pounds, and at 19 inches long, with a nearly 19-inch height and 16-inch width, it is going to take up some serious space on your counter, table or island. This is the most precise cutting machine here, with deli style thin slices or big meaty 1-inch thick slices available with a quick knob adjustment. The tilt table lets you even slice the most delicate food stuffs like artisan bread loaves, and the giant sized feeder handle makes pushing even the heaviest cuts of meat into the blade, nearly effortless. Even though this is the most expensive slicer here, for heavy use, precision and efficiency that is second to none, this one is a good bet. The Waring Pro Food Slicer may come in at the least priced machine here, but don’t let that fool you into thinking that it isn’t capable either. You’ll get thin slices, but not deli thin, and you’ll also be able to slice up to 1/2″ thick. For most people, that won’t be a problem. The 130 watt motor is up to the task, but the plastic gearing does not allow heavy duty slicing. If you push or force fed the blade too hard, or cut meats and cheeses that are frozen, the gears might strip. It has a plastic hand guard, but the carriage is made of stainless, and they can be sink washed and cleaned. At 18 inches long, it’s a good sized slicer, and the 7.5 inch blade will accommodate most sized meats and cheeses. This is the least expensive food slicer on the list, but if you can live with its limitations and only do lightweight food slicing, the Waring Pro will do you good.